George Booth Root III was born on September 29, 1906 in Oakland, CA. In 1915, he moved to Nevada with his mother, Ruth Godfrey Root and step-father, Walter Post. During this time, George changed his last name to Post. Beginning around the age of five or six, Post showed an interest in drawing. He started formal art classes in high school. His art teacher recognized Post as a stand-out pupil and submitted some of his drawings to the California School of Fine Arts in San Francisco (currently called San Francisco Art Institute). Post received a scholarship and began his two and one half year education there in 1924. It was during this time that he studied landscape painting and was introduced to painting en plein air. In 1927, Post left school and worked in a variety of labor oriented jobs. By 1929, he was craving to use his artistic skills again and began to search for employment in which he could incorporate his talent. 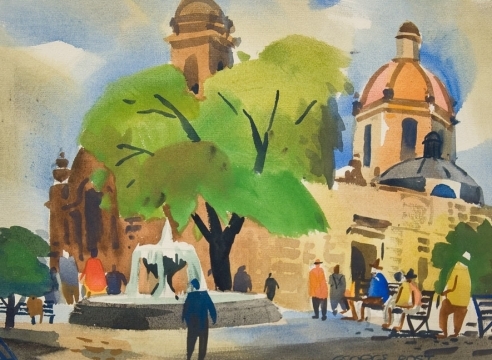 While strolling the streets of San Francisco on a job hunt, Post stumbled upon an exhibition by the Carmel-based watercolorist, Stanley Wood (Sept. 12, 1894-July 28,1949). These works depicted regional scenes of California cityscape and landscape. 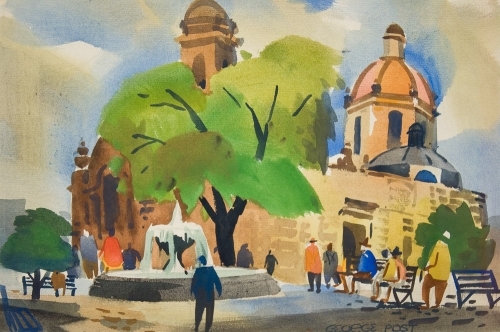 Post has said these works sparked his interest in watercolor and attributes Wood’s exhibition of crisp, bold pieces as a major influence in his artistic career. Finding time to paint was of incredible importance to Post. Since one painting would take him about one to two hours to complete, he was able to paint every day and still maintain a “day job”. In 1930 he took a job producing commercial illustrations and advertising designs. During this time, Post also married Lou Rusk MacLean, a young art student. The couple had one daughter, Shelley, but divorced several years later. In October of 1931, Post’s diligence paid off. His well-developed portfolio featuring California and Nevada scenes was displayed in a solo exhibition at San Francisco’s Galerie Beaux Arts. As the Depression was growing worse, Post was laid off from his job, and over the next three years worked on an oil tanker traveling to New York and back through the Panama Canal. He also spent time in Sonora, California, where he assisted his aunt and gold miners who were flocking to the Mother Lode region. 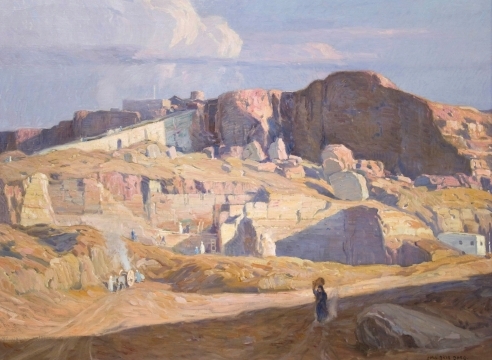 This period of time allowed him to paint and create important historical documentations of the Mother Lode region and seaports during the Depression. Money saved from his work with the WPA allowed Post to travel to Mexico, Europe and Canada from 1937 to 1938. Traveling gave him an opportunity to paint, and when he returned to San Francisco, the artist was in high demand, with three to four solo shows a year. In the 1940s, Post added a new aspect to his career, teaching. He began instructing summer school watercolor classes at Stanford University. To his delight, the experience left Post with a desire to teach more classes and he decided to continue. From 1947 to 1972, he taught at the California College of Arts and Crafts in Oakland. In 1949, he began teaching at the Brandt-Dike Summer School of Painting. Post taught at the school until 1955 and continued after its name change to Rex Brandt Summer School of Painting until 1977. From 1971 to 1987, Post taught classes through T.H. Hewitt. Teaching allowed him to paint with his students, therefore giving him the ability to continue his career as an artist and share his knowledge with his students. Post retired from teaching and painting in 1988. He resided in the city of San Francisco, painting occasionally, until his death in 1997. As an artist and a teacher, Post had the ability to make fresh, simple statements with confidence and effortlessness. He taught his students that, “painting should be quickly and easily tied together and accented with the individual shorthand symbols of the artist’s own particular calligraphy.” Post’s work reflected his advice. The artist’s works have a simplicity to them that requires a high level of mastery and apparent ease with painting in watercolor. Post did not receive any formal training in watercolor painting while he was a student at the California School of Fine Arts. He was completely self-taught and credits actual time spent painting as having greater influence over his skills than any class. This especially applies to his inclination for painting outdoors. The majority of his paintings were done on-site with Post kneeling over the paper, applying carefully planned and executed strokes. By watching his surroundings and going to museums and exhibitions, Post developed a style versatile enough to be accepted by the Modern art community, yet conservative enough to be included in more traditional circles. Post’s earliest works were mainly farm or landscape scenes produced using a wet into wet technique. In order to achieve soft edges that capture skies, clouds and water, Post would soak paper in water then, while it was still damp, he would apply paint. Throughout the years of World War II, his style evolved. By using a wide flat brush, Post formed thick, bold, transparent lines. These angular strokes formed a very personal and individual style of geometric abstraction. He also integrated the use of white paper, refusing to use white paint. In the late 1940s and early 1950s, the artist began to use an off-brand paper that many artists shunned. This inexpensive paper was too thin to allow for alterations once the initial paint had been applied. Paint must be applied with direct, firm and well planned strokes. Use of this difficult paper further acknowledges and reinforces Post’s skill as a watercolorist. George Post did not find it necessary to paint dazzling subject matter. His work generally portrays dockyards, streets, small towns and San Francisco hills. The artist resisted trends of painting only things of perfection, but focused on the mood and feeling of his subjects. His paintings are fresh, individual and realistic. They capture scenes of the West Coast with admiration and present them to the public with a deep love. Through his lifetime devotion of capturing it onto paper, Post has helped us to realize the unique beauty of the West Coast. 1. Ferbrache, Lewis and George Post, “Interview,” Smithsonian Archives of American Art, April 9, 1964. 2. Hughes, Edan Milton. Artists in California, 1786-1940, San Francisco: Hughes Publications, 1989, p.892. 3. McClelland, Gordon T. George Post. Beverley Hills: Hillcrest Press, Inc., 1991. 4. McClelland, Gordon T. & Jay T. Last, California Watercolors 1850-1970, Beverly Hills: Hillcrest Press, Inc., 2003. 5. Paintings of George Post. Sept. 10, 1999 to Nov. 30, 1999. Mendocino, Calif.: Mendocino Art Center, 1999.